Factual error: While Stanley Kubrick boasted about the authenticity of the candlelit interiors, he must have missed the little drawing of a steam train on a period map - 40 years before trains were invented. Character mistake: When Barry Lyndon is talking to his mother privately, while standing on the bridge overlooking the water, Barry's mother refers to Barry's son Brian as being "at the mercy of his stepbrother", meaning Lord Bullingdon. They have the same mother. Lord Bullingdon and Brian would be half brothers, not step brothers. Continuity mistake: Barry is introduced to Gustavas Adolphis, the 13th Earl of Wendover, by Lord Hallam, to help him obtain a title. In the receiving line to meet Your Majesty, another man is introduced as Lord Neville, yet later when Barry is eating in a restaurant and runs into the 13th Earl of Wendover, he calls him Lord Neville. It seems his name should be either Lord Wendover, as he was called previously, or Lord Adolphis, as we learned that his real name was from Lord Hallam. Trivia: Stanley Kubrick's daughter has a cameo as the young girl sitting behind Lady Lyndon at the magic show. Narrator: Barry - had now arrived at the pitch of prosperity and by his own energy had raised himself to a higher sphere of society. Having procured his majesty's gracious permission, to add the name of his lovely Lady, to his own. 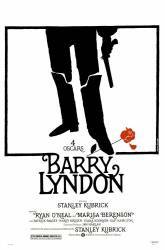 Henceforth, Redmond Barry assumed the style and title of: Barry Lyndon. Redmond Barry: It is an honor to meet you, Your Majesty. I knew Sir Charles Lyndon before his passing. King George III: We were very fond of Sir Charles Lyndon. Redmond Barry: I'm not sorry. And I'll not apologize. And I'd as soon go to Dublin as to hell.